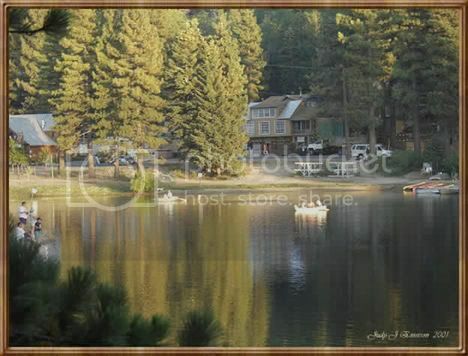 Green Valley Lake is a small lake located in the San Bernardino mountains. This lake is popular with So. Cal. trout anglers because of its nice setting and large stockings of Rainbow trout. The lake also has a few bass,catfish, and a large amount of small crappie. Good lake to rent a paddle boat and throw some mini-jigs and trout worms for some nice fish. Shoreline anglers also do really well using Powerbait, nightcrawlers, and lures. Take the 215 North to the "Mountain Resorts" turnoff (Highway 30 - East) or Interstate 10 to Highway 30 - North and follow the signs to Highway 330 and to Running Springs. Green Valley Lake is 7 miles from Running Springs towards Big Bear. Go 4 miles on Highway 18 and turn left on Green Valley Lake Road. Continue 4 miles further to the lake.